Key Research Organization(s): Tuya Vera Geo Corp; Geothermal Management Company Inc.
Geothermal energy is a renewable energy source within the crust of the Earth which can be utilized for the generation of electricity; however, the oldest use has been "direct" use for heat, industrial and therapeutic purposes. Previous studies of geothermal energy in British Columbia have focused on mapping and evaluating resources for electricity generation. Direct-use geothermal development projects can use lower temperature resources, but the thermal energy, unlike electricity, cannot be transmitted over large distances. Currently in British Columbia, direct-use geothermal energy is used exclusively for hot springs developments. Worldwide, direct-use geothermal energy is more widely used in heating, agricultural, industrial, commercial, snow clearing and recreational purposes. 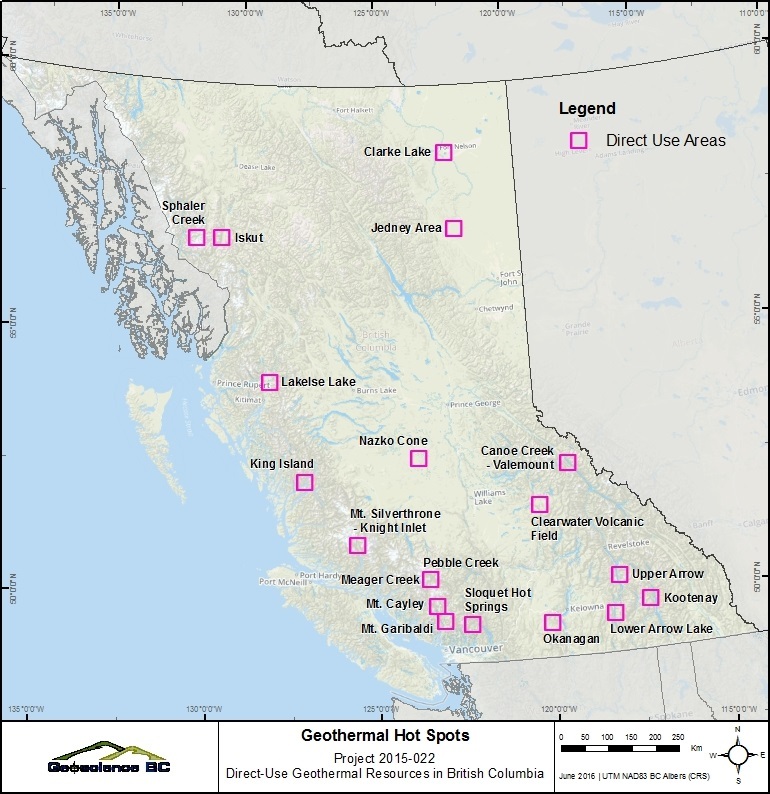 Direct-use geothermal resources are a potentially underutilized asset in British Columbia. However, with development hurdles for direct-use applications being significantly lower than for electrical applications, there are untapped resources that could potentially be developed. The purpose of this project is to first identify and evaluate direct-use geothermal energy opportunities for BC communities that have the potential to reduce green-house gas emissions or be economic development drivers, and secondly, to give communities and businesses in BC an understanding of what resources are available and what steps they may take to evaluate these geothermal resources. The project will be led by B.C. based Tuya Terra Geo Corp., working in collaboration with Geothermal Management Company Inc. and their respective teams. The first stage of the project will provide a technical evaluation of the Direct-Use geothermal energy opportunities in British Columbia that will build on the results of the recently released study of the electrical generation potential for geothermal in British Columbia (Kerr Wood Leidal and GeothermEX 2015) , and other publicly available research. Tuya Terra Geo Corp. will lead this data analysis using a community based participatory approach with a strong First Nations emphasis. Many of the communities with Direct-Use potential are First Nations or have significant First Nations representation. A recommendation of the Direct-Use Geothermal Resources in British Columbia project report and accompanying Roadmap was to develop materials to explain Direct-Use Geothermal opportunities and requirements in British Columbia. • Links to other useful resources.